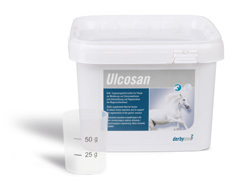 Ulcosan addresses many of the causes of gastritis and therefore can be seen as a systematical and integral treatment. The healing of gastritis and stomach ulcers is supported by the herbal components (grape seed, milk thistle, yucca schidigera, licorice root). Pectins of carrot and apple pomace build up a gel layer to protect the stomach wall. Magnesium citrate and Tryptophan have a stress-reducing effect and address the reasons of stomach problems. Pre- und probiotic yeasts support the digestive processes and balance the bowel. Ulcosan is given with the feed.